www.concreteproducts.com December 2018 • 73 ADVERTISEMENT Exclusive patented solutions for transmission and auxiliary devices are the core of every SICOMA mixer. These unique features combined with unique counter flow compulsory mixing action, provide the best technology in concrete production. Reliability, consistency, repetitiveness of results, high performance level, heavy duty capabilities and easy main- tenance are the key factor of the SICOMA mixers, along with high customizability of every product, because every plant is different. Our products cover a wide range of productivity per batch: from tests in laboratories and small quantities concrete production to the largest 12cy compacted output per single batch, our mixers can satisfy any need in terms of capability and quality. Along with skip hoists, batch feeding systems (including cement and water scales), dosers for liquid and powders, several batching plant accessories and concrete distribution systems, SICOMA provides the largest and most specific products range in the concrete market. For such various, wide and growing market, SICOMA is organized since decades with its own structure to provide technical assistance and spare parts in many places in the world. In the U.S., our offices and warehouse are located in Clearwater, FL, from where we can easily achieve any area in North and Central America. In addition to that, with our global network of official dealers and OEMs, we are even closer to concrete producers and their plants. Our technical personnel is highly qualified and has all skills to support your needs. SICOMA global experience and knowledge in production of concrete and mixing processes are available at your service to increase even more your high quality concrete production. 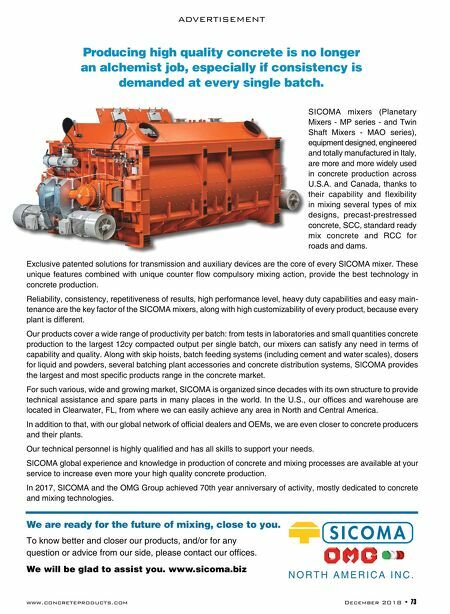 In 2017, SICOMA and the OMG Group achieved 70th year anniversary of activity, mostly dedicated to concrete and mixing technologies. We are ready for the future of mixing, close to you. 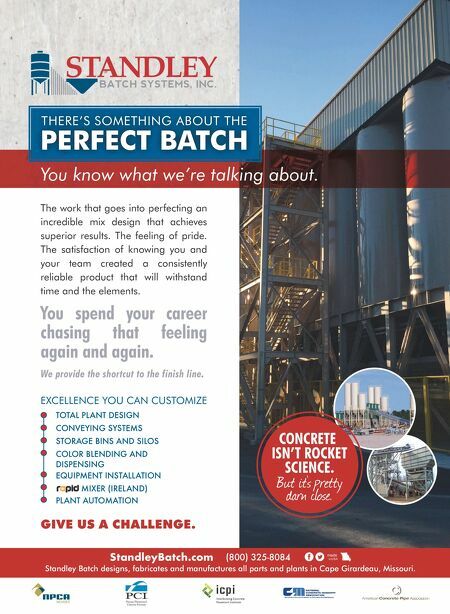 To know better and closer our products, and/or for any question or advice from our side, please contact our offices. We will be glad to assist you. www.sicoma.biz Producing high quality concrete is no longer an alchemist job, especially if consistency is demanded at every single batch. SICOMA mixers (Planetary Mixers - MP series - and Twin Shaft Mixers - MAO series), equipment designed, engineered and totally manufactured in Italy, are more and more widely used in concrete production across U.S.A. and Canada, thanks to their capability and flexibility in mixing several types of mix designs, precast-prestressed concrete, SCC, standard ready mix concrete and RCC for roads and dams.